Hundreds of early human fossils, artifacts and forensically recreated faces of mankind's prehistoric relatives went on display Wednesday, exploring 6 million years of evolution at the National Museum of Natural History. The nearly $21 million Hall of Human Origins marks the 100th anniversary of the Smithsonian Institution museum and represents the most comprehensive look at human evolution since its opening. The massive hall includes rare specimens, including the only original fossil of a Neanderthal skeleton in the United States. Two skulls discovered more than a century ago of a Neanderthal and a Cro-Magnon are on loan from the Musee de l'Homme in Paris. Curator Rick Potts, who directs the museum's human origins research, said the permanent exhibit represents major changes in scientists' understanding of evolution over recent decades. "What we've learned is the old icon of the march from the early humans from a primate like creature to an ape like creature to us today is not correct  that our species is part of a diverse family tree of perhaps as many as 20 species or more," he said. "What we also see is we are the only one left." That makes the story of evolution a survival story, Potts said. The exhibit is the first to examine how climate change motivated adaptations and changes in human ancestors. Rather than focus on a single spectacular fossil or discovery like many evolution halls, the Smithsonian exhibit is built around the major milestones of evolution  such as when humans began walking upright, grew larger brains and began using tools and symbols. "All of these things are part of what it means to be human from the sense of our species," Potts said. Life-size bronze sculptures of various early humans line the gallery to illustrate milestones, such as the eating of meat and the control of fire. One statue caught the eye of 6-year-old Surya Jain of Toronto, whose family extended their vacation in Washington by a day to see the new hall. "I think it's really cool," he said of the statue slightly taller than himself. "My favorite part is the Homo erectus carrying this wildebeest, I think." His mother, Sonali Verma, said the many hands-on elements are sure to engage children as well as adults. They were among dozens of visitors who lined up outside the gallery before its unveiling. "We're trying to get visitors to connect with their ancestors in a very direct way," said exhibits director Michael Atwood Mason, noting several new approaches in the hall. A "morphing station" allows visitors to have their photos transformed into how they might have looked as early humans and e-mail a copy to themselves. Former Sen. Bill Frist, who is on the museum's board, was among the first to try it out. Casts and fossil scans also allow visitors to see key discoveries from recent decades. Lucy, the world's most famous fossil, has a corner. She is a 3.2 million-year-old early human who walked upright and climbed trees. Replicas of early human footprints nearby in the floor allow visitors to walk in prehistoric steps. On view for the first time are scanned replicas of the "hobbit" fossil discovered in Indonesia in 2003, which was part of the Homo floresiensis species. 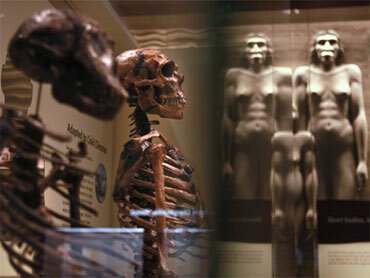 "It will change your ideas about humanity," Smithsonian Secretary Wayne Clough said. "You can peer into the eyes of your ancestors." Most funding for the exhibit came from billionaire David H. Koch, executive vice president of Kansas-based energy company Koch Industries Inc. Koch, who was the Libertarian Party's vice presidential candidate in 1980 and donates to conservative causes, gave $15 million to fund the project. The group Greenpeace staged a small protest outside the museum Wednesday with signs saying Koch is "wanted for climate crimes." They handed out fliers saying Koch also funds projects denying climate change. Museum director Cristian Samper said Koch was keenly interested in science and committed to the museum's research. Physicist Peter Buck, co-founder of Subway restaurants, also gave $15 million to fund ongoing research of humanity's origins and to begin new education programs tied to the exhibit.